Every single day I go to office since the past six months and pretend I'm enjoying what I do , not for anyone else but me , to keep doing it happily . But guess what BREAKING NEWS. I don't enjoy what I'm doing and I rather be doing something more productive , not that this isn't in some lame way but I wish I was doing something better. So one of these days when the drama failed THIS happened . Heavy ranting ahead. ki exam kab chalu ho and uss bahane toh chutti mile. and whether you deducted tds at the correct rate. I don't care if your processes are in orderand if you are showing all your income and making all the diclosure , Menu ki man . continously tick tick tick chalta rehta hai dimag main thinking of something or the otherI don't remember the last time I was blank and nothing was crossing my mind. PS : Sorry for the language if it offended anyone. This is frustration meets PMS at best , so adjust please :P PPS : My dear UdanKhatola is a very dear friend. My best friend since the past 18 years ( *wink* at udankhatola) . Yeah 18 years , thats like almost all my life . Yeah , we are awesome we know. She is new to blogger . Lets welcome her :) at Chai, Crayons, Cupcakes and all that..
Bwhahahah absolutely LOVED every inch of this!!! 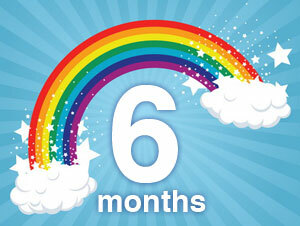 happy six-month-a-versary =) to you too. Welcome to the real world baby!